The image that first comes to many peoples’ minds when they hear “wind energy” is of the large turbines spinning near Evanston, Casper and Cheyenne. One Wyoming company hopes to change that perception and greatly reduce costs at the same time. 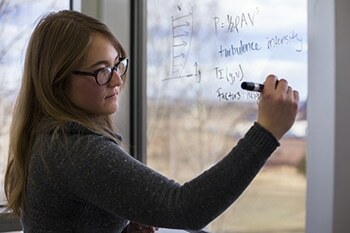 AirLoom Energy is now well on its way to making this technology a reality thanks to help from the Wyoming Small Business Development Center Network. The idea for the AirLoom started in 2013 when Robert Lumley’s enthusiasm for kiteboarding drew him into the study of wind power. To help secure funding for this project, Lumley turned to the SBDC Network’s Wyoming SBIR/STTR Initiative (WSSI). Kelly Haigler Cornish, WSSI Program Manager, helped the company apply for and receive nearly $1 million in funding. 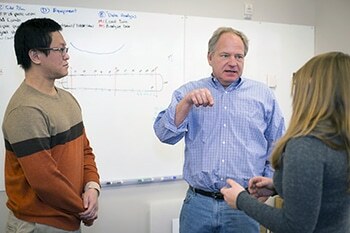 Haigler Cornish assisted AirLoom Energy in their application for funding, which led to the company’s selection as a recipient of a $225,000 National Science Foundation Small Business Innovation Research Grant (Phase I). In 2017, the National Science Foundation awarded continued funding for the project to the tune of $750,000 (Phase II). Competitions for these nationwide grants is steep. 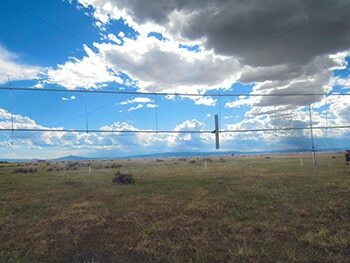 In fact, AirLoom Energy’s latest award is the first NSF SBIR Phase II grant to a Wyoming company since 2009. With funding in place, AirLoom Energy’s team has been busy putting their theories into practice. 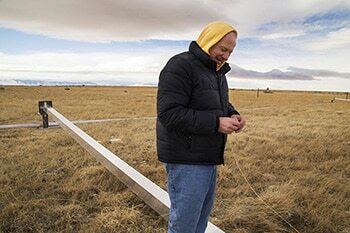 A working prototype of the AirLoom is in its final stages of development at the University of Wyoming’s Wind Energy Research Center Field Site. The company is confident that their product can offer an alternative to bulky wind turbines at a 15 times cost advantage by requiring 23 times fewer materials and reducing transportation, maintenance and land costs. 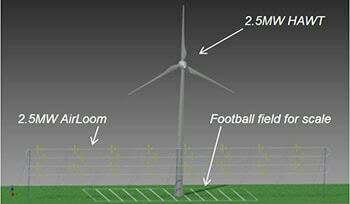 The innovative design also offers greater flexibility as far as wind farm location and size. So how does it work? The AirLoom utilizes the same aerodynamics as the traditional turbine, but instead of requiring massive supports for large rotating blades, the AirLoom captures energy through translational motion in the tips of multiple small gliders (resembling model airplanes). These gliders then travel along a vertical oval track tethered by bridles. The patented bridling system distributes, rather than concentrates the downwind forces, eliminating the primary cause of the traditional turbine’s massive size and cost. Demonstrations of this process can be seen right now at airloomenergy.com. The AirLoom’s other major innovation is to run airfoils in an oval rather than a circle. This alters the math behind “swept area,” the key input for generation capacity. Innovations for traditional turbines generally work on the margins without addressing the geometric limitations of the design. To increase power production, traditional turbines must build ever-bigger and -taller circles, limiting their scalability and siting options. An AirLoom’s swept area, in contrast, is a function of both length and height, rather than radius squared. An AirLoom oval can be tens of meters or tens of miles in length, constructed at multiple angles, and stacked or arranged in checkerboard arrays for flexibility and scalability. This renders the AirLoom suitable for a far vaster range of utility scale, mid-size and mobile (emergency, rural and defense) locations. Height and width are no longer a requirement but a design choice made to maximize the value of a site.